Keeping up a snail’s pace with heads down intent on strategizing the rocky terrain had an advantage. When we finally focused on something other than knees and ankles we discovered we were seeing green on the ground. Green! The color of life. We were walking through a delightful garden that lifted our spirits and magically erased our aches. An important garden, too. A sign said it was a preserve. We could see that this was no hand-tended garden, though we later learned it had been helped along by volunteers who planted seedlings to insure the vitality of certain species. 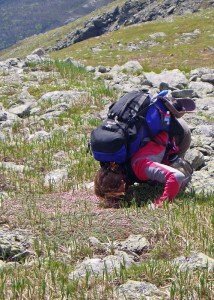 This lovely surprise was an alpine garden on the Monroe flats near Lakes of the Clouds. 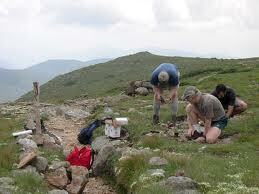 There are other gardens like it in the Presidential range of the White Mountains. In fact, the Alpine Garden on the other side of Mt. Washington is one of the most visited. 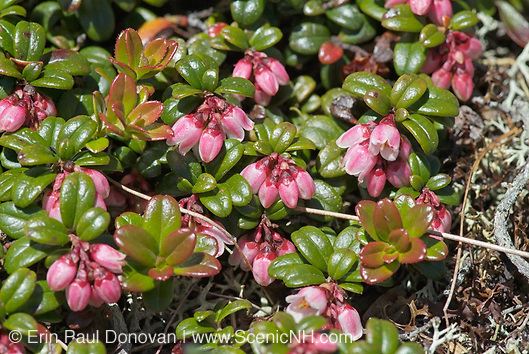 You can find alpine gardens on New York’s Adirondack Mountains, on Mt. Mansfield in Vermont, and on Mt. 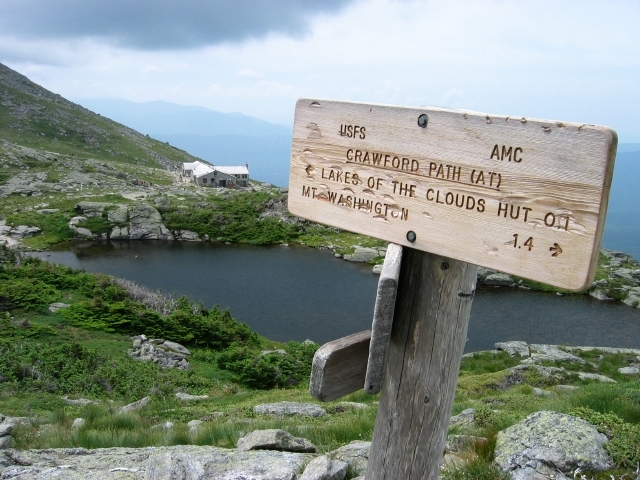 Katahdin in Maine, but I am abbreviating the list of locations. 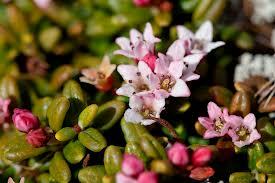 And, of course, you will find many of these plants in the Arctic. Eons ago, this was the Arctic. Treeless tundra patchworked with these gardens dominated the scene. Climate change melted glaciers and stole acreage from the tundra, pushing it back into Labrador and points north. 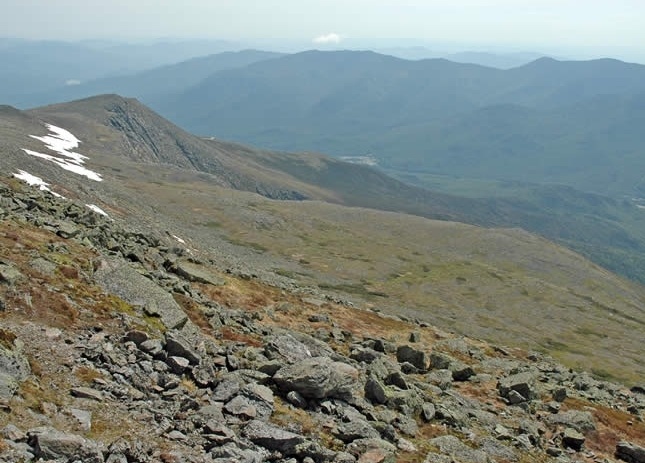 What’s left here today are memories of the tundra, islands of gritty alpine plants that stake their claim on thin, grudging soil and stand up to wind and weather. Sometimes these gardens are referred to as lawns because they are usually found on plateaus or gentle slopes. They are restricted by altitude. You won’t find them much below 5000 feet because competition from other plants is too great. Nor will you find them on the inhospitable steep cones of mountain peaks. The growing season is short here, and we were hiking in August. The spring blaze of color and fragrance — Lapland rosebay, diapensia and alpine azalea — was long gone, as were the blooms of summer — bistort and mountain avens. Darn! That meant we had also missed the spring invasion of black flies. Feisty, they can be pesty on a calm day even above the tree line. Now, as we walked along we saw a garden shutting down for the season. Fluted, fan-like leaves of mountain avens, their blooms now become seed heads, were curled and crumpled. 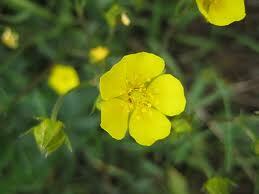 Dwarf cinquefoil, was also finished for the year, leaves bunched and low to the ground, huddled against wind. 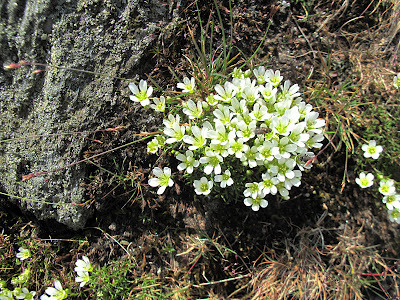 Starry white blooms we couldn’t identify (mountain sandwort?) were truly the stars now, poking out from crevices, demanding to be noticed. Berries on carpets of mountain cranberry and bilberry should have been ripening but they did not catch our eye in the dull light of a misty evening. 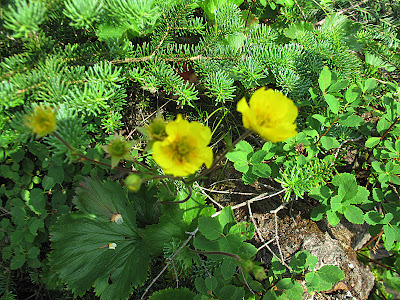 Mountain cinquefoil, Potentilla robbinsiana, sparks an intriguing mystery if you’re a botanist. It’s a relative of the cinquefoil we grow for decorative purposes in our gardens, and the unwanted black sheep that invades our gardens. Its common name comes from the French words for five leaves, cinq feuilles. Botanically speaking, this refers to the five leaflets that form a single leaf. Growing here, in the Alpine Garden there seem to be only three leaflets to a single leaf. Did genes toss away leaflets to help survival? Or did genes add leaflets to plants in our lush temperate zone to help them compete with aggressive neighbors? Unfortunately, hikers loved the yellow blooms to death, trampling the plants almost to extinction. It doesn’t help that thirteen years can pass before a plant sets seed. There’s a happy ending. Successful conservation measures and targeted plantings have brought it back. It looks comfortable here on the Monroe flats, as comfortable as plants can look on an anorexic diet of thin soil, extreme cold weather and high winds. How do any of these plants survive here? The words Tough, Stubborn, Hardy come to mind. Opportunistic, too. They’ve adapted. Some hug the ground, spread by creeping, avoid the high winds above. Thick leaves, leathery, waxy, some with scales conserve moisture, reflect ultra-violet light. Sedges that dare to test the wind have supple stems. Others find shelter in crevices or spread by rhizomes. Since they live on starvation rations, leaves are small, stems are short and roots are deep. But flowers can be showy to attract the few pollinators that dare to survive here. They have allies. Pebbles, for one, unlikely though this may seem. If the pebbles are not disturbed, they form a pavement beneath the plants that keeps the thin soil from being blown or washed away. And mists, those blessed mists. They might frustrate hikers like us looking for the grand view, but they bathe these miniatures with an elixir that keeps them going in thin soil and mountain sun. We’ve never walked through this garden before, but we know these plants. They are friend or foe, depending on their status in our gardens. Relatives of weeds we pull or garden plants we grow, differing from them by only a gene or two. 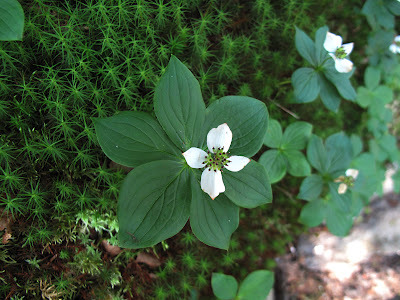 Their species Latin names tell the story of their lineage: Rhododendron lapponicum; Arenaria groenlandica; Cornus canadensis; Geum peckii (named for a mountain botanist); Silene acaulis (short-stemmed); Loiseleuria procumbens (creeping). 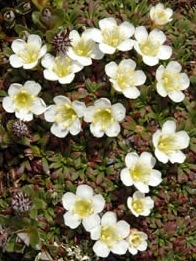 Their common names in order: Lapland rosebay; mountain sandwort; bunchberry; mountain avens; moss campion; alpine azalea. 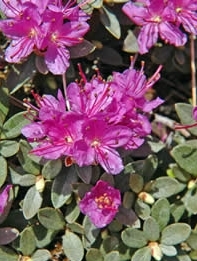 The last Latin name is tongue-twisting, but it is a relative of rhododendrons and azaleas). It was tempting to dally in the garden, but signs admonished us to stay on the path. As tough as these plants are, they wither and die under trampling. Well, we didn’t need much admonishing. We’d forego extra steps for a hot meal and a good bed. We moved on. Life in the gray rock! Would we ever see this again? A garden growing on top of a mountain. A remnant of times when great animals like mastodons and dire wolves roamed. We looked one last time, drinking in the dusty greens, but neither of us thought to try for a picture in the dim light. We were thinking too much about tomorrow. 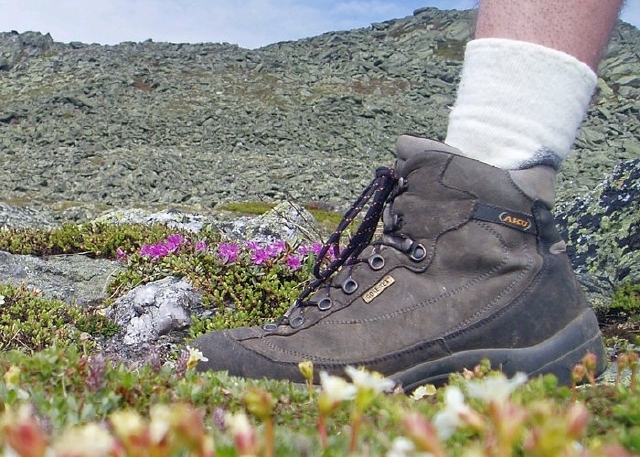 We thank the excellent hiker/photographers for the images used in this entry.